Giants Software, developer of the Farming Simulator franchise, has released details on the upcoming package of downloadable content for Farming Simulator 17, available May 9, 2017, on Xbox, PS4, and PC. 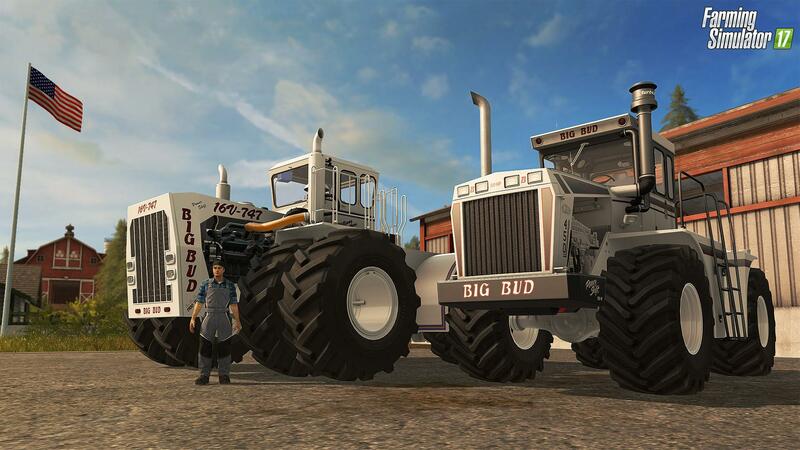 Giants had previously announced the DLC would feature “Big Bud” – a custom-built tractor first seen in Montana touted as the “World’s Largest Farm Tractor.” Information on the equipment included in the DLC pack has been slowly trickling out through weekly fact sheets posted to the Giants Twitter and Facebook accounts; to date they have released six of them, providing detailed looks at various implements as well as two “Big Bud” tractors. In a Facebook post today, Giants indicated that additional information had been posted to the Farming Simulator website. The site appears to have been updated with pictures and information on everything that will be included in the DLC. According to the pictures posted to the website, the package will include the aforementioned “Big Bud” tractors, three sowing machines, three cultivators, a plow, an auger wagon, and a manure spreader. As indicated by the theme of the DLC, these new implements are typically much larger than existing equipment in the game. For example, the largest sowing machine currently available in Farming Simulator 17 is 15.0m (50 ft) and the largest cultivator available is 14.5m (48 ft); the upcoming DLC features a 25.6m (84 ft) sowing machine and a 24.0m (79 ft) cultivator. Players appear to be pleased to see some larger, North American-style equipment being added to the game, however it has raised questions regarding the utility of the DLC equipment given that the maps provided in the base game consist of relatively small fields which do not necessarily require the types of larger equipment seen in the new offering. This has raised speculation that Giants may be planning on releasing a map with larger fields in future DLC, however the company has not provided any information on what might follow the “Big Bud” package. For now, it appears that those seeking larger fields to use the massive tractor and implements on will be best served by maps created by the modding community such as “American Outback,” which consists of large fields in a southwestern United States setting.